Taking the 'Waverley' - colour feature on the former St. Pancras-Edinburgh Waverley train. The Bombing of Britain's Railways 1939-45: A War Diary: In the first of a four-part series chronicling attacks on the railway system during World War II, John W.E. Helm reviews the early stages of the conflict. Where there's Muck - Albert Allen recalls his working days on the Beckton Gasworks railway system in London. Just the two of us - colour photos of the two LMS rebuilt 'Jubilee' 4-6-0s. The steam railmotor: L.A. Summers looks at the rise and demise of the GWR's railmotors, which he describes as 'Transport for the Masses'. Day Trip to the West Midlands - Alistair Nisbet remembers a visit to Birmingham and Wolverhampton in August 1964. The Class 50s in the South - colour spread by Paul Joyce on the English Electric Class 50s on the Western and Southern Regions. 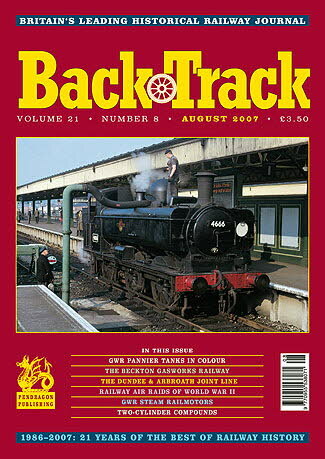 Parade of the Panniers - four pages of colour photos of these iconic GWR tank locomotives. The Dundee & Arbroath line - Niall Ferguson writes about this important section of the East Coast route in LMS days. The Metropolitan Rothschild Saloon - Michael J. Smith describes a luxury carriage provided for the journeys of the wealthy Rothschild family. More South Western - another colour feature of locos of the former LSWR. Thomas Worsdell, August von Borries and Two-Cylinder Compounds - Part One - Michael Rutherford delves into the development of two-cylinder compound locomotives used in the British Isles and built here and exported. Motive Power Problems on the Southern Region - from official records J. Crosse uncovers more issues raised between loco operating departments and management. Rolling Stock Focus - Pre-Grouping Survivors - six colour photos of pre-grouping carriages still to be found on BR in the 1950s and '60s.